This design is derived from handlettering on a T-shirt I did recently. 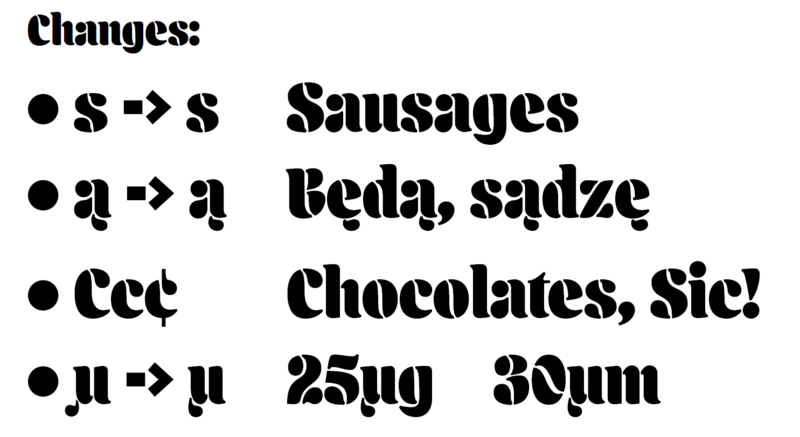 The objective was to keep the letters fat so that the line design could be drawn inside. I made some trials with the ornaments (a-z and some punctuation) and it looks promising, though the shape of the lines evolved in another direction. I tried to make the ornaments to mimic the shape of the letters and make up for the legibility lost because of the stencil effect. For now though, I'd like to ask for critique of the solid version. While non-stencil display type can be read with little or no space between letters, with stencils, the reader has to differentiate between struts and spacing. While I can see there's a difference in space/strut width, I think it's not quite enough. It'll look dorky if you space it too wide but I think the current sidebearings put it a wee bit past the frustration threshold. 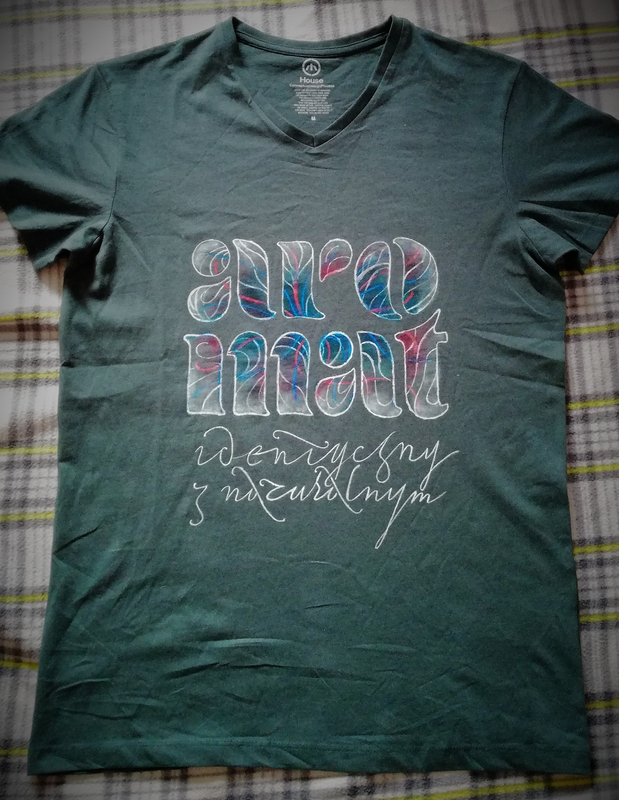 But I think the tight spacing looks fine on the shirt. Really nice work! I'd keep the spacing as it is, actually. The t (and f) looks a bit feeble. Maybe make it just a little bit wider. Nice work Adam—I think you have a winner here! Because of the fluid shapes, I'd round out ever sharp corner (on everything)—especially the small serif aspects. 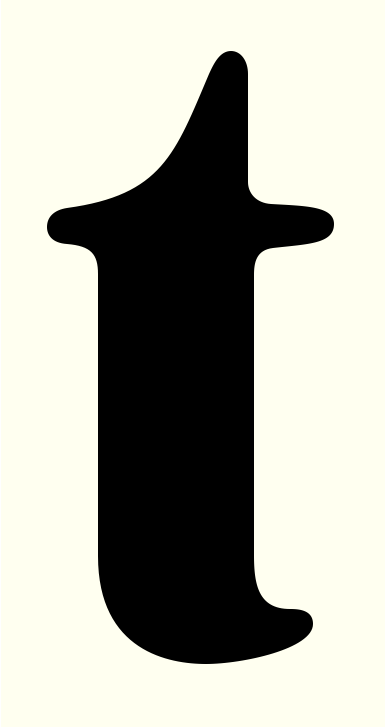 Make the dot on the lowercase "a" smaller—like the period. The spacing is ok for display, maybe just a little more open for smaller text sizes. Lowercase "f" ok—maybe the "t" more like this. Keep up the good work & good luck! I'm back again—you can even introduce the "stencil-like" flow to the lowercase "t" like this.... better I think. Have fun and experiment! That's a good point, Ray. I guess I could try and tweak the sidebearings to make the type more useful for short paragraphs. It would also help with problematic kerning pairs — the way it is now, most of the air is sucked out and there's not much I can do with /z, /x, and /r. I admit I am rather fond of the tightness, though, and I think the target is mainly single words or short phrases. Thanks, Jasper. For /f I made alternates with prolonged crosstrokes that appear in front of round letters and /a. Those didn't show up in the pdf because I forgot to turn on calt. While at it, I thought maybe /t deserves such treatment as well. Both /f and /t have the crosstrokes really short because the serifs on most letters (like /i or /m) exceed the sidebearings by 2 units. This all might be a weird set of choices. Maybe I should shorten the serifs instead of changing the sidebearing of the stem? For now I changed the default variants of /t and /f to include longer crosstrokes, while the short variants, activated as contextual alternates, appear before serifed letters. Another /f variant, with an even longer crosstroke, appears in front of round letters like /o. (See the last page of the updated pdf.) I'm not sure I like the result — if the user doesn't activate calt, they'll see the t and f bump into half of the other letters, and any longer passage looks like its t's are spiking out, piercing through the eyes. I liked the petite, overly frugal versions as the default — what do you think? Anyway, maybe the place to implement this isn't calt? Should I just throw it together with liga? At least this one is on by default in Adobe apps. 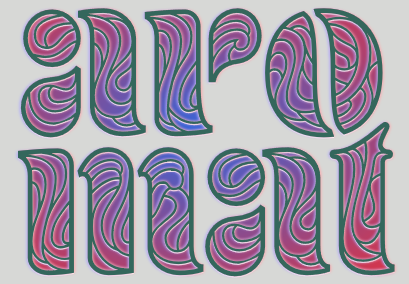 Even though what I'm doing here is de-ligating the letters, quite the opposite. But maybe that's just the stencil counterpart of what traditionally is a ligature. Ligating the whitespace. But perhaps you do not only mean the crosstroke, but the total advance width, especially the right sidebearing? Most people are used to having more space there (after t, f, and also r). But my mind is infested with textura quadrata and that's one reason I'm trying to treat /f and /t like siblings of /i in terms of advance width. That last /t seems curious, I feel it would somehow resonate with my cap /T — connected but indented. I think the very circular tittles and top terminal of /a/ stand out a bit; a more flowing shape might be more appropriate. I made the terminal on /a slightly lighter and along with the tittle, periods, dieresis — more squarish. The /a terminal also now sits a bit lower. What do you think now? Those changes made a huge difference; quite easy to read. I get tripped up on e and c though. I still think something's off about s. Everything about this typeface is nice and bold, the t feels nitty gritty. I'm not sure the centered ogoneks work, though. It should be flush with the right side of the /a, for instance. Also, the /mu is hard to parse; the tail should rather curl to the right under the body. Great job on the /Germandbls! Sorry, s was supposed to be t of course. Thank you everyone! I appreciate your input a lot. I made the s narrower. I tweaked the terminals to look more like teardrops in both /s and /c. I was surprised to see the more geometric shapes work better, it somehow seemed counterintuitive before. There is still room to go in this direction with /z, this one seems more tricky, though. I adjusted the /aogonek, this time moving in the opposite direction, away from naive geometry. It looks more polite now, but I think the previous version was more playful? (Btw I'm Polish But perhaps I shouldn't use that fact to justify bad decisions). Thanks for your /mu suggestion, Christian! That's what I've been missing. The .calt variants are longer than .long ones and appear before @e, @o etc. This way the long-stroked variants appear also where the context is lack of context. If the user prefers the short strokes everywhere or in a particular place, they turn off calt. I think the arm of /r/ could be narrowed a bit to help close up that space underneath. Yeah, the /r is rather ungainly at the moment. The drop is too heavy. Maybe it could eat into the stem a bit so as to save horizontal space. The ogonek could still move a bit more to the right edge in /aogonek. Maybe allow it to hollow out the foot of the stem above to make itself more prominent. My /agononek is almost always a unique glyph rather than a composite since those ogoneks need a lot of manual attention to fit into their parent glyph. They are really more like limbs of the glyph than accents. The /mu is much better, but still looks a bit like a /u with an accent below. Maybe explore a design with a continuous left stem down to descender depth. I don't know how unreliable/outdated/amateur this is, but I've been seeing it here and there. Don't know if that's how someone might actually have been writing some time ago (probably not most of the Greeks today), or if it is just a misfortunate trial of translating English cursive into the Greek script, but I have definitely seen a Greek person writing her /mu by first writing a /u and then crossing it on the South-West. Nevertheless, joining the parts seems to work better anyway, and since I already have joining elements in T and Q, this is just confirming the rule. The variant with the teardrop seems more at home to me, what do you think? I slimmed the r a bit — 15 units. In addition, the top of the stem is now thinner by 5 units, and the bottom is slightly wider than normally (it was this way before, too, to a lesser extent). The third one is not quite convincing, though. And here comes the moment I ask: do the separated elements in /B /K /R /eight work? I've been getting this weird off vibe from them. How about this? I also changed the top arm of K. Two bottom rows show the old version — I find it quite charming, though less legible.I get the impression that the stenciled B is better, though. 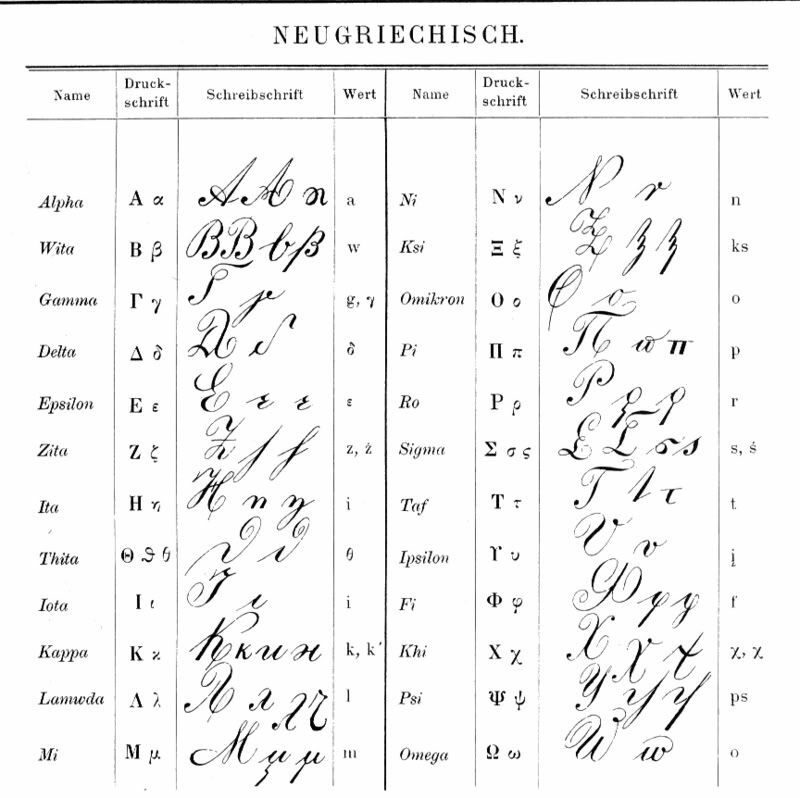 Maybe I could provide the connected versions as stylistic alternates? Or the other way around. Updated pdf below, screens above are from the last page. Definitely the mu with the thinner connection. Thinning of the /r/ looks good (adjusting the stem too was a fine idea). No need for the more experimental fixes IMO. I like the more separated /B/K/R/8/. Maybe keep working on the /K/ arm. The revision is more graceful but I think might carry it over too far into /R/ territory. There's nothing very wrong with including stylistic alternates, but in this subtle of a case I'd probably say use your judgement to decide your favorite and just go with that. The ogoneks were redesigned again. Test strings in the new pdf (it is only 4 pages this time to keep it easy to look at). I tweaked /D/V/W to occupy less horizontal space — they seemed too heavy. But then I thought maybe the construction of /W with the counters reaching almost to the baseline is a bit naive? (Old bottom, new top). I worked more on the arm and leg of the /K. Perhaps the two variants are even compatible? (See Kraków on the second line). Hello again. I've been polishing up this project lately. I'd appreciate you taking a bit out of your time to skim through the enclosed pdf listing some OT features built into the font (and point out anything that seems odd to you). Thanks! Whew, that's a lotta OT stuff! I'm intrigued by the different unicase options. Personally I'd cut SS02, the M and N alts aren't nearly as appealing as the defaults. All the swashes that end in points feel a little out of place to me. Just love the dollar sign!